- You Can Also Wrap This Scarf On Your Head To Stay Stylish And Warm. - Perfect to Cover Up Dresses and Gowns. - Sophisticated Texture And Colors. ACT NOW - Click The "Add To Cart" Button To Take Advantage Of This Limited Time Offer! ?We Changed The BRAND Name ELLES CLOTHING To PETAL ROSE. Eye Catching Bride Scarf perfect for a bridal event and a bridesmaid. Shawls and Wraps - perfect for a dressy party or a special elegant event. Super soft, cozy and comfortable - this circle loop style is a great accessory for spring, summer, winter, and fall. 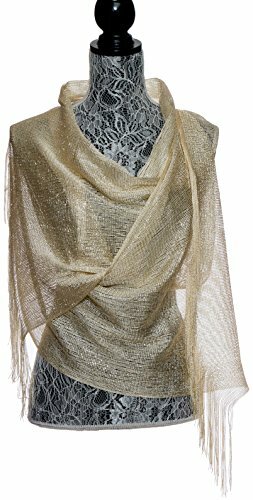 ?These Fashion Shinning Lightweight Lace Scarves have a Shimmer Metallic Thread Accent and an Open Knit Design. Are Available in Many Gorgeous Colors: Red,White, Silver, Gold, Green, Pink, Navy Blue, Yellow, Orange, Burgundy, Grey, Beige, Champagne, Teal, Purple, Turquoise. Ladies can wear it long, knotted, looped, twisted, or doubled around neck. 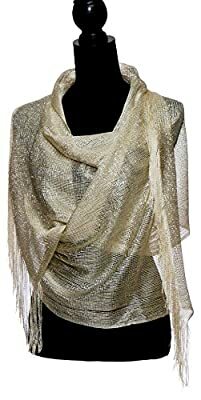 ?Trendy Solid Color Shawls and Wraps can be styled over the shoulder with any type of Dress, Blouse, Sweater, Jacket, Blazer or Shirt for a charming look. Popular for both adults and teen girls. Multi-purpose accessories! ?Material: 100% Polyester. Hand wash in cold water, tumble dry for long lasting performance. Measures Approximately 82" by 19", Fringes 7". ?Makes a GREAT GIFT for Valentine's Day, Black Friday, Cyber Monday or stocking stuffer for Christmas, Mother's Day,Graduation or other special occasions. Buy one or more of these luxurious scarves for gifts. ACT NOW - Click The "Add To Cart" Button To Take Advantage Of This Limited Time Offer!